Dinner invites to the Curry household are given out like candy. As she shuffles through her produce, the mother of four—who in 2006 was named by Switzer Learning Center as South Bay Woman of the Year for health and nutrition—describes what will be served that evening: farmer’s market Mediterranean white fish, a medley of fresh vegetables, rice pilaf and her signature house salad. “Then Megan is gonna help me make a lemon tart,” Peggy adds, smiling. 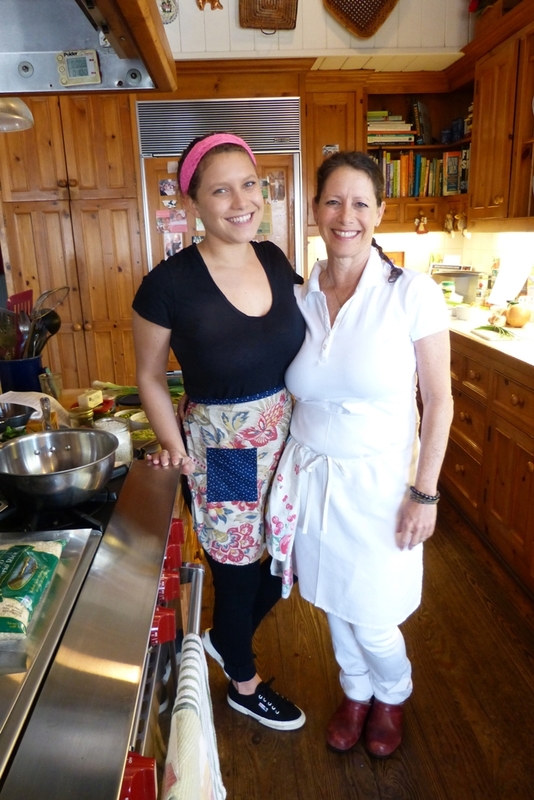 Preparing healthy, delicious dishes together seems like second nature to the Manhattan Beach-native mother-daughter duo. After all, it’s their job—or at least one part of it. About two years ago, the two joined hands to create Curry Girls Kitchen, an educational initiative to raise awareness about healthy eating, particularly for families. From private and group cooking lessons to parent education workshops and pantry makeovers, the Curry girls offer insight and guidance every step of the way from the grocery store to the kitchen. Now they’re taking it one step further, as they prepare to lead a group of clients next month through the Curry Girls’ version of Dr. Alejandro Junger’s nationally acclaimed Clean Program, a three-week body cleanse with organic foods. At the informational session and demo Wednesday night at Pages bookstore, Junger himself was present to give the introduction, lending the Curry Girls credibility, and naturally, his blessing. “He wrote this book on the premise that you can clean and heal your body through food—it’s amazing and totally doable,” Peggy says. After all, the Curry girls are walking testimonies of this very premise. Growing up, Megan remembers being sick all the time. Her condition gradually worsened until its peak during her senior year at Mira Costa High School: She with her family had just returned from vacation, and for a week, she was bedridden with a 105 degree fever. With nothing to lose, Peggy and Megan decided to get an internal test and discover the root cause. “Sure enough, we’re gluten intolerant,” Peggy says. It actually turned out that the entire family was affected by the genetic condition but all showed different symptoms. Pushed by her own past struggles with food, Megan initially aspired to become a therapist to help other girls affected by eating disorders. She studied psychology at University of Colorado, Boulder, and graduated in 2011. At the time, Peggy was heavily involved in GrowingGreat, a “school garden, nutrition education nonprofit” she co-founded in 1999. It began at the five Manhattan Beach elementary schools and has since expanded to 250 classrooms in 35 schools across 16 school districts, including Culver City, Los Angeles, Palos Verdes, El Segundo, Santa Monica and Hawaii (singer-songwriter Jack Johnson is a huge supporter). Through her other business, Kitchen Blessings, Peggy taught cooking classes, racking up more than 400 students across the South Bay. One day when Megan was visiting home from college, Peggy told her that she was considering giving all her clients and material to a chef she worked with. Kitchen Blessings is no more, and Peggy is no longer involved in the day-to-day operations of GrowingGreat. That has made ample room for Curry Girls Kitchen, the newest Curry venture but most importantly a passion project for both. As they exchange these words, eyes begin welling up. Perhaps partially due to another great piece of news they heard earlier that morning: They received word that a major publishing house in New York is interested in green-lighting their co-written lifestyle cookbook, Growing Great Families, which is stock full of original recipes and family anecdotes—about 25 years’ worth. That root, she explains, comes down to what we feed ourselves. “It dictates how you feel, how you interact, how you nourish other people, to be able to give and receive,” she explains. The oldest of four, Alex, is a Fox Sports host for the L.A. Kings and Angels; Annie, the second youngest, is studying film production at UC Santa Barbara. Naturally, these two have taken on the tech bulk, from launching CurryGirlsKitchen.com to setting up social media accounts. Her family’s strong, visible bond, explains Peggy, was cultivated nowhere other than around the dining table in their beautiful Manhattan Beach home, where the girls were raised all their lives. “This table is the heart of every home,” Peggy says. Now with all four Curry girls out of the house and in their own walks of life, convening for family dinner every night is difficult, if not impossible. Still, the Curry tradition lives on.